First Noel [C5274] - $8.00 : Yarn Tree, Your wholesale source for cross stitch supplies. Cross stitch pattern by Foxwood Crossings. Four small ornaments each featuring an angel holding a "Noel" banner or a nativity scene. A large pattern featuring an angel above the nativity scene is included. 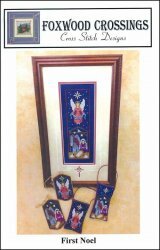 Stitch counts: Large Picture 35 x 110, Small Shape Ornaments 29 x 51, Nativity Ornament 35 x 72, and Angel Ornament 35 x 58.